Linking up with Anika at Pasando today! What can I say, once again you have scored a wonderful shot! Every detail of this shot is fascinating. Her shadow, her jewelry, her smile at someone I cannot see, her clothes, etc. 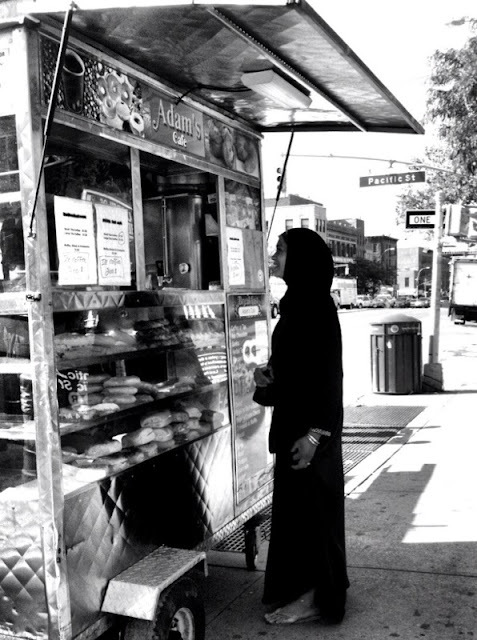 love seeing ny streets through your lens... wonderful shot! Lovely street photo, great shot. (and I say that from an uncaffeinated state, which means that's really something)! great street shot and love the clash of cultures! Familiar sight. Although the flip flops with the hijab is pretty funny.